Nature Reporters: Fall (and "elk love") is in the air! Fall (and "elk love") is in the air! It feels "freaky" outside right now, kind of like impending tornado weather! Yesterday was absolutely gorgeous though, so Kenny and I headed to the North Carolina side of the Great Smoky Mountains National Park to go see the elk "rut". The herd was intro duced in 2001 and has now grown to ~109 animals. It is a long drive for us to go to Cataloochee, over 100 miles, so we had not been to that part of the park in a long time. There is really no easy way to get to that more remote part of the park, you have to drive on a narrow gravel road for a few miles to get to the "cove". There is a nice overlook area along the road that offers some fantastic views of the mountains. The fall colors are beginning to appear in the higher elevations. 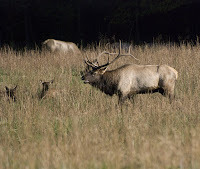 Before we went to see the elk (they only come into the fields to feed early in the morning and late in the afternoon), we explored other areas of Cataloochee. Our first stop was at the Palmer Place. It was interesting to read how well-off many of the families in that area were in the mid-1800's until the 1930's when they had to leave because their land had been taken over by the formation of the National Park. There is an unfortunate stereotype of the mountain people being like Lil' Abner, Snuffy Smith, or even worse, the creepy characters in the movie Deliverance. True, they often didn't have much more than an 8th grade education, but they were hard workers and very self-sufficient. The Palmer Place is one of the old homes that has been preserved by the park. The home was used for several generations by the family, part of it was used as a post office and even a boarding house for early tourists to the area. The upstairs rooms had peeling remnants of old wallpaper, some even had newspapers from the turn of the last century plastered to the walls (most likely with flour paste). I looked to see if I could see a page with a date to no avail, but many appeared to be from the very early 1900's. I'm sure the kids in the home enjoyed looking at the pictures and funny ads on the wall. It looks like things haven't changed much, people have always tried to get money from others! I noticed some pretty orange butterflies flitting around the old log cabin at the back of the house. 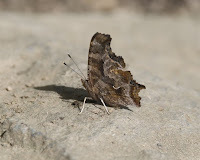 I was happy to finally get a good photo of a Comma Butterfly, one of the "anglewings". It is easy to see how it gets its name when you see it with the wings closed, there is a definite comma mark on the lower wing. These butterflies are amazingly well camoflaged when they are sitting on dead leaves with their wings closed. The first el k we saw was an old bull, the #2 on his ear tags indicated he is one of the original elk from the 2001 release. We later learned from one of the "Elk Bugel Corp" volunteers that he is 12 years old (they can live for ~16 years). We thought it was odd that he didn't seem to move around much, finally we saw that he had been injured, his rump was raw and covered with flies. It was nice to hear later that the park biologist was going to treat him later that night. :) Most of the elk wear radio collars and bright ear tags to help track and identify them. I guess the animals don't mind the extra "jewelry"! The collars are made to tear away if they get caught on vegetation. Around 4:30 p.m. we headed to the fields where the elk come out to feed in the evening. We were delighted to hear the males bugle as they tried to woo the cows and intimidate the rival males. One large bull had taken over a harem of cows and calves, the volunteers said they had never seen him before last Saturday. He did not have a collar or tags, so he may have come in from another area. He was qu ite a handsome fellow with an impressive rack of antlers, however the females didn't seem to pay him much attention. I would imagine they have already mated by now. Poor guy, I guess he is out of luck this year! He chased some of the young "spike" bulls away; with just small, unforked antlers, they didn't have a chance against this guy. One still had velvet on his antlers. Like all the other bulls, this big fellow will lose his antlers next March and immediately start growing another set. I took my spotting scope to get some good close-up views of the elk. It was fun letting other people enjoy looking through it too! The photo on the left was taken with the scope attached to my camera, all the other elk photos were taken with a 300mm telephoto lens. One fellow had a 600mm lens, ooh, that was nice! I'd like to get something like that, but at >$10K I doubt that will happen unless I sell a LOT of my photos! There was a pretty large crowd of elk watchers there f or a Thursday evening, I can't even imagine what it must have been like last Saturday and Sunday! I'll finish this out with a shot of the bull, a cow and her calf. The "rut" is nearly over for this year, it lasts from early September through mid-October. I'm glad we got to watch this amazing spectacle of nature before it comes to an end!